Fennel is a well-known herb. But it is not uncommon in the wild. There are several places on roadsides around Cambridge where wild fennel may be seen. 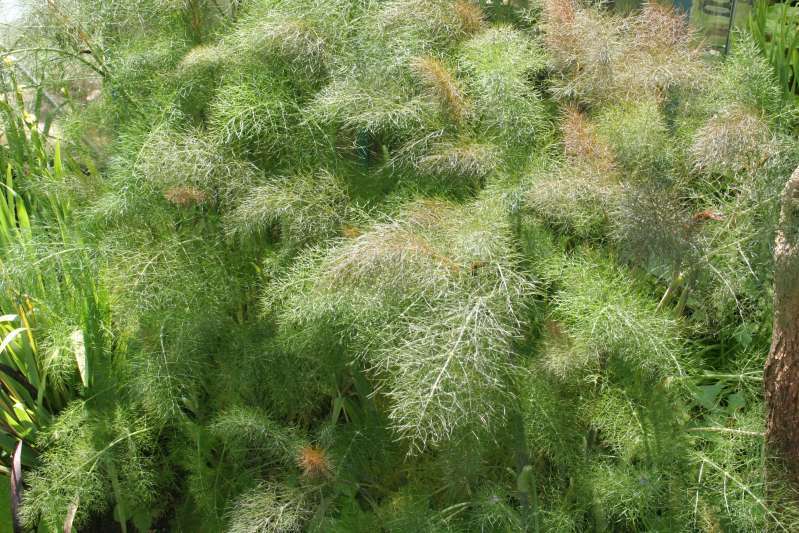 The picture is of a cloud of the cultivar - Bronze fennel. Taken 31st May 2008. In spring, when the fennel starts to grow, the young leaves, almost before they have opened, make a fine tasty addition to salads - but don't put too much in as the taste is extremely strong. The older leaves can be used as a pot herb. Particularly good with fish: steam the fish on a bed of fennel. The other common cultivar is the Florence fennel - grown for its bulbous stem bases. If you are growing this yourself, it has a tendency to sprout small stems, just as wild fennel does, but these young stems are more swollen, more succulent and milder flavour than wild fennel, so once you have cropped the main 'bulb leave the root in to re-grow for a second crop.